Osprey Rook 65 Backpack for Men is a lightweight pack from a new 2019 series, with an adjustable torso size, rain cover, excellent ventilation, and very affordable. 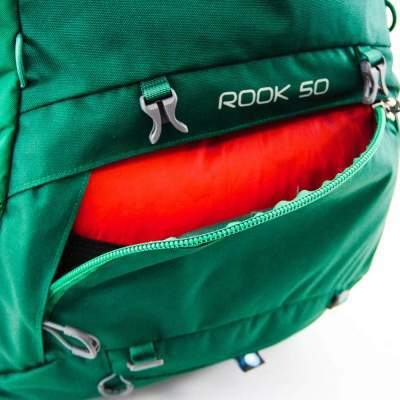 Osprey Rook 65 pack in one out of two colors. 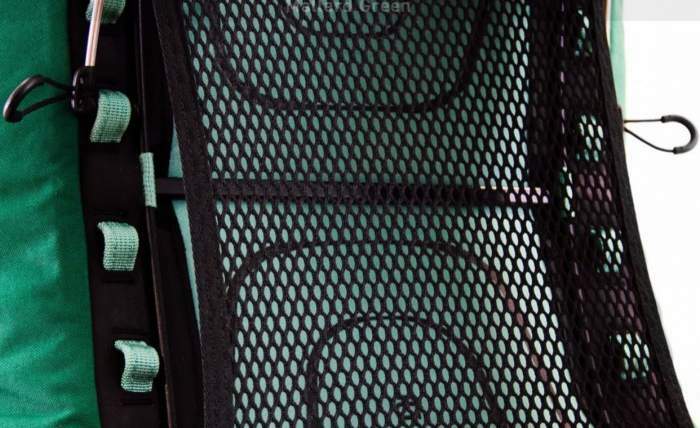 Excellent ventilated back panel with a trampoline style mesh. Attachments for Osprey Daylite and Daylite Plus packs. This pack is currently available on Amazon and this link should redirect you to your local Amazon store, they have them currently on 5 continents, so you can save a lot on shipping. 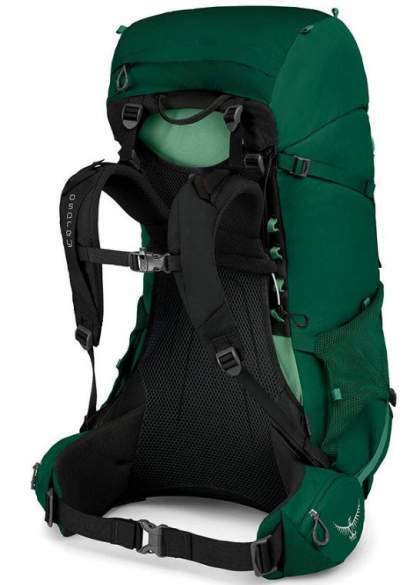 This Rook 65 is the larger of the two packs from this new series from Osprey that includes also the Rook 50 pack. As usual, they have the corresponding packs for women, the Renn 50 and Renn 65 backpacks. They have built these packs to be affordable but as reliable as any other of their hiking and backpacking packs. So some features are missing, but almost everything that is essential is still there. You will realize this from the features presented below. The volume and weight ratio. The more volume capacity with less weight, this is the idea. But the weight carrying comfort cannot be compromised. So all that is needed is here as it should be, and the volume/weight ratio is around 41 liters/kg, which is really impressive. Of course, you have a far better value in their new Exos & Eja packs and also in Levity & Lumina packs, but the suspension in the Rook & Renn series is far better. In fact, I have made a comparison with the Exos & Eja packs so you can have a look here. These Rook and Renn packs have a great hip belt which is not so in the other mentioned series. This is a top loading pack with a classic lid and a collar. But you also have a sleeping bag compartment shown below with a divider between the two compartments. This divider is detachable, there are buckles which you can undo and have one single compartment with a bottom access as well. You also have a bonus rain cover which comes in its own pocket on the bottom, see the picture below. The pack is hydration compatible and you have a reservoir sleeve inside the main compartment. The suspension is the best part of this pack. You have a fully adjustable torso size and the adjustability system is a quite unique ladder-type. I have not seen anything similar on the market. It is shown in the picture below where you see the loops and locking bars on the sides, so the harness slides up and down along the side rails. This adjustment system allows for several discrete positions for the torso length, therefore it is not a continuous type which is based on Velcro hook-and-loop connection. You can still do a bit of the usual fine tuning with the shoulder straps. Unique torso adjustment system and the tensioned mesh for ventilation. The mesh which you see here is tensioned by the LightWire peripheral frame which also transfers the load to the hip belt. This is what they call the AirSpeed system and it offers the best possible ventilation. It keeps the pack away from the body, and air can circulate in all directions. The same type is in their Levity & Lumina and in the new Exos & Eja packs. But the hip belt in the Rook & Renn packs is well padded so the suspension system here is much better. One extra feature here – they have built two attachment positions for the load lifters, this is useful when you move the torso attachment far in any of the two directions. By repositioning the load lifters you can better stabilize the pack. The sternum strap is rail-type and it comes with an emergency whistle. This is a great suspension system. This pack comes with 5 pockets. Two zippered pockets are on the hip belt, you can see them in the picture above. On the sides you have the usual stretch mesh pockets with dual entry points (also visible above) from the top and from the side. You also have one large zippered pocket on the lid. The pack has dual compression straps on each side. The lower straps are directly connected with the hip belts and this is a quite unusual design. 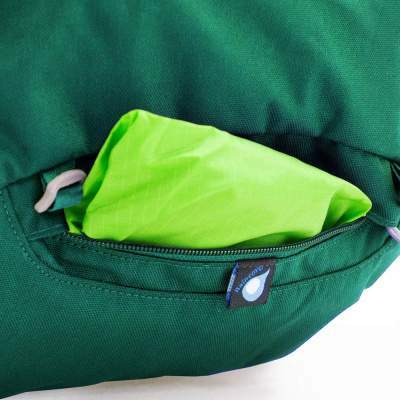 Dual removable straps are on the bottom, and here you can attach a sleeping pad or a tent. You have 4 attachment loops on the lid, so here you can attach a pad, solar panels, or anything with the help of extra cords. 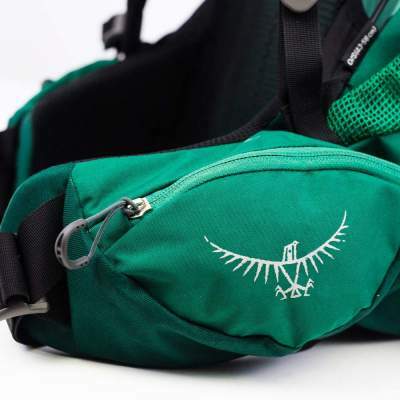 On the front, there is nothing but webbing loops where you can attach Osprey’s daypacks i.e., the Osprey Daylite backpack and Osprey Daylite Plus. Very good hip belt padding. No attachment for poles or ice axe. Weight: 3.53 lb (1.6 kg). Capacity: 3967 in³ (65 liters). Dimensions (L x W x D): 29.13 x 14.54 x 14.17 in (74 x 42 x 36 cm). Colors: 2, see the pictures. Warranty: Osprey’s All Mighty Guarantee. If you compare the dimensions of this pack and Rook 50, you will see only one centimeter difference in one of the dimensions (the depth). On the other hand, if you compare it with Renn 65 which has the same volume, you will see that the dimensions are quite different. I was puzzled with this and contacted Osprey and asked, I thought this was a mistake. They replied and sent me this picture below which is supposed to explain it. Although the dimensions may be almost the same (like between Rook 50 and Rook 65), or quite different as in the case of Rook 65 and Ren 65, the volumes may still be very different or exactly the same. The blue line would imply a smaller volume than the pack described with the green line, although the two dimensions are the same. They write that the volume is not always determined only by the dimensions of the pack. The shape of the pack plays a role and affects the overall volume. See the picture which shows the same depth and length but the shape is different. This may sound logical but on the other hand, a pack is a not a solid body, and if you add more fabric as the picture suggests, you will get larger dimensions. In the case of Renn 65 you have (L x W x D) 67 x 37 x 36 cm, while in the Rook 65 the dimensions are 74 x 42 x 36 cm. So the Rook 65 is both taller and wider while the depth is the same, yet both packs are supposed to have the same volume. Sounds impossible to me but I am a theoretical physicist and perhaps I am overthinking things. So I remain puzzled, but this is what they say so judge yourself, I thought you might be puzzled with the dimensions and just wanted to share what I know. What do you think about this? 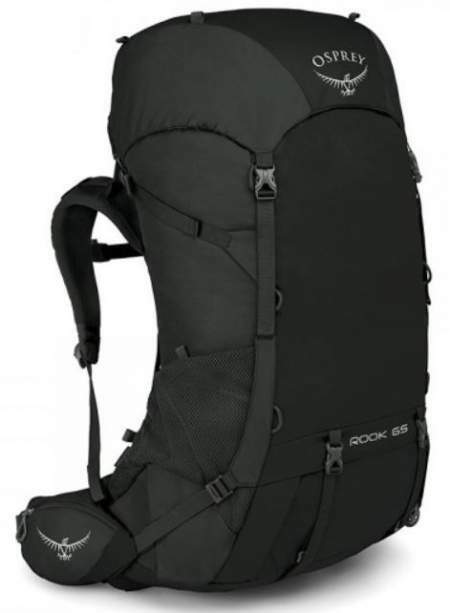 In the table below I give this Rook 65 pack side by side with two top-notch backpacks from Gregory. I am showing the packs from the same weight and volume range and this is on purpose. As you realize, the Rook 65 stands really good with them. But I am certain in one thing, those two are not a match to Rook 65 when it comes to ventilation. Please follow the links for more. So they have managed to build this Osprey Rook 65 Backpack for Men as a very affordable yet quality pack. Its best features are those that are the most important ones, i.e., those related to suspension and carrying the load. So here you have ventilation that is as good as it can possibly be. There is not much to object to its hip belt either. The pack is with a great volume/weight ratio and the price is fair. I have included it in my list of best backpacking packs for men and with all good reasons. Check my comparison text Osprey Rook & Renn vs Osprey Exos & Eja backpacks, all features from those series are summarized there. For more packs in this size range please check my page with packs above 55 liters, only top brands are presented. You might want to know that this is not a sponsored post and I am not paid by the brand or related to them in any sense. Please use the comment box below in the case of questions or comments. Have a nice day. “In the case of Renn 65 you have (L x W x D) 67 x 37 x 36 cm, while in the Rook 65 the dimensions are 74 x 42 x 36 cm. So the Rook 65 is both taller and wider while the depth is the same, yet both packs are supposed to have the same volume. Sounds impossible to me but I am a theoretical physicist and perhaps I am overthinking things. Thank you Paul, yes you are right about strange times. This about equality is a fashion now, I guess it will pass, it must because it makes no sense. Women and men are built differently. 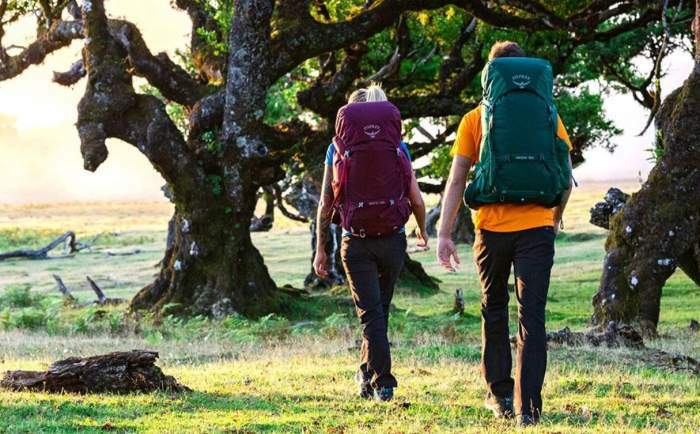 Osprey as a great brand takes this into account so indeed their packs for men and women are different, but this about different dimensions yet the same volume is a logical puzzle for me.